Referencing tax revenues received by State and local governments. Yes, there will be some negative repercussions to legalization. And as this is a financial report, it is imperative that we go over them and tabulate the figures. It is important to understand that as these are (essentially) lost tax revenues, that they MUST be subtracted from any additional revenues produced by legalization. The estimate is around $2-Million dollars in net losses to Oklahoma communities should Cannabis be legalized. For good or be it bad, Oklahoma has a very high rate of “Civil Asset Seizer Cases,” which in turn acts as a cash cow for many municipalities. In some cases (such as in Caddo County) even private cops have been hired to make seizures. And while civil seizers may originally have been intended to go after big time criminals, the average seizer in this state is less then $2,000. And that is usually taken from individuals without the means to fight it out in court. Thus, easy pickings. However, as the Fed’s get some portion of this, the estimated (take home) calculation is somewhere closer to around $2,000,000. ---- NOTE, this is obviously a ballpark estimate, but given the lack of open record data available, it is the best that this report can come up with. Also note, that this is money that the state will loose upon legalization. And that’s just one county Sheriff’s department. 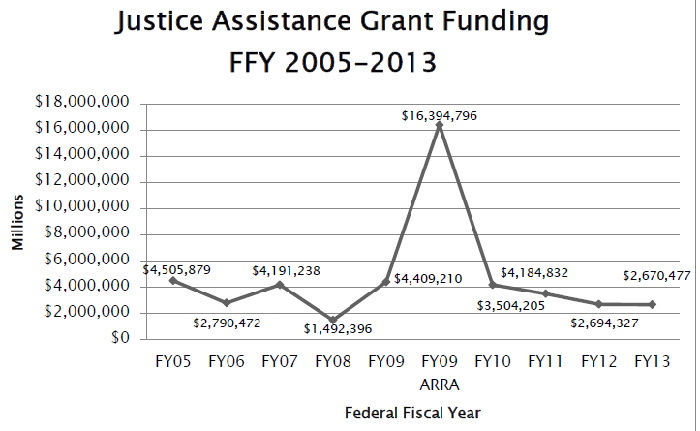 One can only wonder what ALL OKLAHOMAN LAW enforcement is obtaining in federal grant monies. 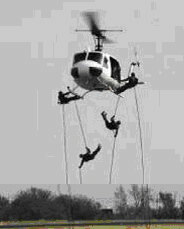 All one needs to do is to take one look at these clowns on the left; A picture of Oklahoma narc’s during a marijuana eradication training exercise, to figure out that it must be costing an arm and a leg to be doing that. But exactly how much Federal grant funding will be lost is probably anyone’s guess, and will depend upon a number of factors. EXAMPLE: Colorado, after legalization (for one reason or another) lost all its Federal marijuana eradication funding. The exact potential figure of lost grant monies is unknown. Literally speaking, it could be zero if the Federal Government shifts its law enforcement focus away from marijuana eradication to something a bit more useful. But assuming the role of a pessimist (if we are to error, let us do so on the side of caution), we should acknowledge their losses. It therefore seems imperative that we at least establish some kind of ballpark number that we can (at least for now) use in our tabulations. A figure that is estimated being at $4-Million dollars per year. First the DEA, the Office of the Drug Czar, etc., are not just authorized to lie, when it comes to re-legalizing marijuana, it is quite Okay to do so. And that’s not a joke, the federal narc’s are officially empowered to lie. Next, even if the narc’s themselves were honest, the grants all seemed to be shrouded in so much mumbo-jumbo, that (at least on paper) their true meaning is almost meaningless. They all might as well hypothetically read; “Grant to give lost children candy and arrest medical Cannabis patients.” There simply no way of tracking down exactly what was used for what. Then there is Oklahoma’s own opaque system of record keeping, which seems to have been put together to hinder as much as possible. Example: Thanks to our methodology of record keeping, our own State prison system doesn’t even know how many of its own prisoners are being held their for marijuana offenses. No joke, they don’t known. Last of all there’s the number of federal grants available to law enforcement for various purposes. Thus fund monies can literally be coming from various programs and be all mixed together, etc. However, even with all that we do have some semi-useful public figures that we can look at. Meaning that (essentially) the bulk (over 85%) of those funds went into fighting the War on Drugs as oppose to violent crimes. And (again as per the report) 422 or 28% of the 1,523 drug arrests were (we presume) solely for marijuana. Now doing a little math: [$2.5-Million x 85%] = $2,125,000 dollars. And 28% of that is [$2,125,000 x 28%] = $595,000 dollars. And who knows what else. Estimated costs are unknown but significant. Even spread out over several years, they are still somewhere in the million-something or another area. And there are yet other “War On Drugs” sources of Federal Grant monies available. Sources such as Urban Areas Security Initiative (UASI) ; or State Homeland Security Program (SHSP), etc. Which this report has not been able to track down. AND WHILE these Federal Grant programs may have started out with good intentions, at this point it appears that their main reasoning for being is to keep the War on Drugs going and that means keeping the War against Marijuana going. Thus our view, which my definition must be the pessimistic view of things, is therefore that we should be prepared to loose ALL, or at least most, JAG grant funding (a historic average of around $4-Million per year) as well as some funding from other sources. Granted, this will ONLY be temporary as sooner or later even the Federal Government will see the light, but until then the State should be prepared to loose out on approximately $4-Million dollars per year. This report places the negative economic impact to Oklahoma taxpayers of marijuana’s re-legalization (costs of additional policing and court services) at zero. In fact, it appears that legalization will actually reduce crime as well as save the taxpayer tens (maybe even hundreds) of millions of dollars now being squandered away. That young scantly clad collage coeds (under its deathly influence) were jumping out of fifth story windows. That young boys (under its evil influence) were grabbing axes and chopping their parents to death. where Marijuana is now totally legal, there simply have been no mentions of any scantly clad coeds jumping out of fifth story windows, none at all. In addition, we have not heard of any young boys grabbing axes. Simply put Marijuana contrary to what we have been told, simply does not generate crime. Step 1 – Young man at a marijuana party is arrested. Step 2 – Soft on Crime judge, releases young boy with a stern warning and a DRUG CONVICTION. Step 3 – This next step takes about two, three or four years. It is during this time that the young man sees his peers going on to collage, while his Drug Conviction prevents him from obtaining scholarships for same. It is during this time that he tries to get into a union shop apprenticeship program, but is screened out due to his Drug Conviction. It is during this time that he tries to join the army (employer of last resort) but is kept out due to a Drug Conviction. Even an apartment complex that he wanted to move into screened him out because of his Drug Conviction, etc. . . . in other words, it is during step 3 that he now knows that this one simple arrest has ruined his whole life. Step 4 – However, there is one (relatively speaking) somewhat high paying job that it appears he is most qualified for (aka selling marihuana). And (at least according to his prison records), one that leads to his second arrest. Step 5 – Here in prison this “young man no longer”, is exposed to the worst elements of our society and there discovers what a fool he was. Hell, selling Marijuana carries the same penalty as selling Heroin so why not? Go for the money next time. And again, by looking individual prison records in chronological order, it appears that that’s just what he does. Step 6 – By the next convictions, the kid (no longer) is now robbing cooper, selling drugs, etc. You might say he now has a prison record as Long As Your Arm. BUT WHAT IF, the marihuana laws had never existed. Indeed, what would have happened to this same kid if he had lived in Colorado instead of Oklahoma? Would he have been MANUFACTURED INTO CRIMINALITY? The answer is obvious. Now multiply this one arrest by . . . thus the logical belief that our marijuana laws are actually creating more crime than they prevent. We estimate the negative economic impact to Oklahoma taxpayer at zero. In fact full legalization will probably result in mass savings to the taxpayers. While much is said about Federal monies being used to subsidize the medical care of Oklahoma’s indigence, the reality is that some portion of that (be it large or be it small) is being picked up by the Oklahoman taxpayer. Thus the need to examine/review the (medical) effects of re-legalization, those that just might negatively impact our health care system. As it turns out, there are none. In fact it appears that the opposite will be true, resulting in a decrease of expenditures not an increase. Granted, there are many who make the claim that such expenditure will come about, sighting a variety reasons. That our hospital wards will be full of screaming young girls overdosing on . . . (our own wording, not theirs) . . that marijuana is a starter drug, that it’s uses leads to . . . . But be that as it may, today the myths persist. The one getting the most attention today being the one about marijuana overdoses. And truth be told there is such a thing, especially when used in some oral form. However, to date no one has ever died as a result and all effects go away within a few hours. In fact, in all recorded medical literature (1840-1940) there have been less than 70 such documented cases. Half of which were intentionally done as part of one medical experiment or another. Again, no one suffered any permanent effects. Thus this report sees no reason for increased medical costs to the taxpayer. In effect, it is believe that it will decrease the tax burden as marijuana of-and-by-itself is a relatively cheap medicine which can be utilized for a whole host of aliments. Consulting Firms, who for a small percentage of the take, will be more than willing to professionally put together federal grant requests. Computer Programmers and various firms, that sell specialized software, to MAXIMIZE your civil asset seizures. Drug Companies that stand to loose millions if a safe, cheap alternative were made available. Social Workers and Counselors whose jobs just might not be there anymore. Prosecuting Attorneys and even some Drug Court Judges, who . . . let’s face it, will be looking for something else to do. Prison Food Catering Firms etc., who stand to loose IF the number of prisoners is substantially reduced. Oklahoma’s Private Prisons system which operates a couple of prisons here in the state. STOP - It is obvious that the list could go on and on, . . . point being made here is that re-legalization of marijuana will put a crimp on some pretty lucrative jobs, and with these lost jobs might also go state income-tax revenues normally paid to the state. However, while the potential tax losses are real, this report takes the viewpoint that the negative net outflow to the states coffers will (in-effect) be zero. It thus appear that we are talking about loosing almost 49-Million in tax revenues. However, in the opinion of many (certainly of this report) the individuals presently benefiting from our present day laws are a group of pretty sharp individuals who are just ‘playing-the-system,’ and whose talents will simply be focus elsewhere after legalization. A computer programmer could easily find work in some other area. A lawyer will still be a lawyer, etc. In effect, those individuals (again the 1%) will simply shift gears a bit, and in a couple of years it will be business as usual. The only entity that may have some problems after legalization will be Oklahoma’s Private Prison system. 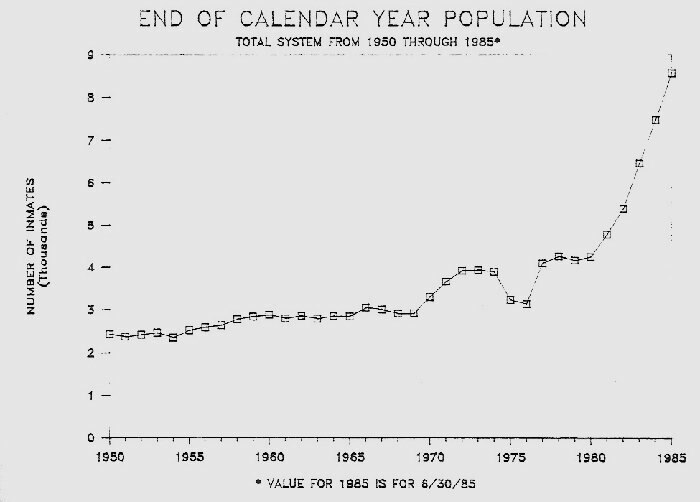 As can be seen from the Chart below, after the War On Drugs was declared in 1972 (meaning the war against Marijuana) the prison population here in Oklahoma began explode. After re-legalization, the prison population can be expected to drop and drop substantially. However, we must not forget that even here, the losers are also the winners as state tax revenues are currently being used to finance much of our present day Drug Enforcement Industries, costing us an arm and a leg to do so. While it is evident that Cannabis use does affect one’s motor skills. It is interesting to note that TO THIS DATE NOT ONE scientific study, that has been able to stand up to the light of day, has been able to establish that it affects a drivers abilities enough to be declare “An Incapacitated Driver.” Thus, we estimate the negative economic impact to the taxpayer at zero. Which can only lead us to one conclusion. Given the desire on the part of the prohibitionists to find something wrong with marijuana and their almost unlimited access to taxpayer funds with which to do so. Therefore, logic and reason would dictate that by now some kind of study would have long ago been done establishing a link between marijuana and impaired driving. Yet NOTHING. Why? The reasoning is obvious, there simply aren’t any and the reason for that being that (under normal usage) it does not. And granted some weirdo will probable over use, but human nature being what it is, this will probably also be the same guy who is going to do it with alcoholic beverages anyway. Thus our logic for stating that (despite the mytho’s), legalization will have a zero sum balance. As much as one hates to say this given the social environment of our times, there probably will be a call for some sort of tax oversight committee to insure that ALL just taxes are paid, etc. An oversight committee which (logic and reason dictate), will probably be some sort of sub-department attached to the Alcohol Beverage Commission. As their current (2015) total state budget was $4,246,000 dollars, which (at least on the surface) appears to be used solely for enforcing alcohol beverage licensing and tax laws. That will mean that any such sub-department will require funding IN ADDITION to what is now being provided. And as the job or regulating, licensing recreational marijuana dispensers will probably be similar to licensing recreational alcohol, etc. That will place the amount at somewhere around $3-Million dollars per year. A bit on the liberal side as there will be no where near as many marijuana dispensaries as alcohol establishments. Yet once again, if we are to error let us do so on the side of caution. The Okla. Dept of Agriculture has a total budget (2015) of around $58-Million dollars, Of which, a look at its budge programs show that over half its budget is spent on things OTHER than Crop Growth (stuff like wildlife preservation, forestry, etc). But be that as it may, in all probability this will be the agency that will be dealing with the Industrial Hemp sector and any agricultural problems faced in the future. And granted, Hemp is somewhat insect resistant by nature (it seems to have some kind of natural insect repellant within it), and is also (of and by itself) a herbicide. Thus not requiring the same attention as other crops. Still, sooner or later some kind of super insect is going to come along and thus the need to monitor and control its growth. Which translates into; -- the “Okla. Dept of Agriculture” is going to need more funding. However, we expect this increase to be no more than $1-Million per year, and that these new funds will be generated via their budgets “Revolving Fund” (a nice way of saying monies obtained from licensing and user fees) from Oklahoma’s the newly created Industrial Hemp sector. Note that here we are NOT talking about higher fees on existing farmlands, but instead new revenues from a completely new industry. One that will be taking over (presently non-productive lands), that will serve to grow Hemp crops. However, as we are presently looking solely at negative taxpayer outflows, at this point, we must take note that an amount of $1-Million (in taxpayers funds) will be needed to meet the added expenses. Although often overlooked by those doing financial reports into re-legalization, it will be shear negligence on our part not to acknowledge that obvious fact that there will be some negative impacts on Oklahoma’s treasure. Expenses that this report shows as being --- $10-Million dollars. Although, it must be admitted that this figure can be brought up or down depending upon the wisdom of those in charge of our state bureaucracies. And, Yes, Yes, there probably are other expenses over looked here. Expenses that will need to be added later, however after a through review of the budget, it is believed that those mentioned above are the only ones that will have any significant (negative) impact. Example: The sale of state marihuana tax stamps, etc., but because these revenues are insignificant we really don’t even believe their very-minor impact is even worth mentioning. And in any case such stamps are bought almost exclusively by stamp collectors who (in all likelihood), will continue to buy them anyway, even after re-legalization.